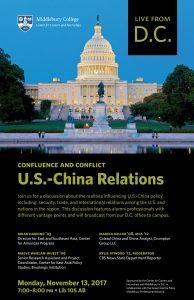 Check out this amazing discussion with several alumni with different vantage points about US-China policy. The guests will discuss the realities influencing this topic, including security, trade, and international relations among the US and nations in the region. November 13 at 7 pm in Library 105 AB. Check out this post by Matt Floyd ‘17.5 about his experience last summer. 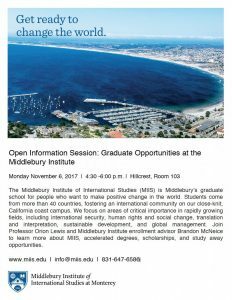 On July 1, 2010, the Monterey Institute of International Studies (MIIS) became part of Middlebury College—a fact that almost all of us are tangentially aware of. But the full benefits of the union have been hard to identify, at least from a student’s perspective. Now that Middlebury has absorbed a graduate program (technically making it a “university”), what does that mean for current undergraduates? Many of us associate MIIS with their stellar Nuclear Nonproliferation Studies program, but are there benefits for people not interested in nukes? I found myself in Monterey this past summer basically by accident. Searching for ways to continue my study of Russia and to boost my Russian language capabilities, I applied to the summer Language School but ultimately was unable to secure funding. 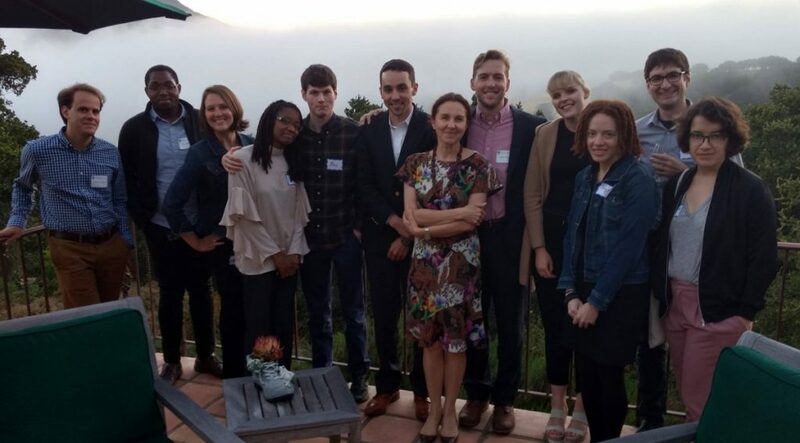 It was through a teacher that I learned of a new program at Monterey called the Middlebury Summer Symposium on Russia, through their Graduate Initiative on Russian Studies, and a partnership between MIIS and Middlebury to fund the participation of one undergraduate student. Other opportunities exist for Middlebury undergraduates to take advantage of the school’s new multifaceted function. 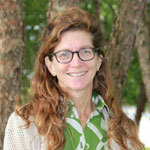 A new Accelerated Degree Option allow Middlebury undergraduates and recent graduates to earn an accelerated master’s degree in areas such as International Environmental Policy, International Policy and Development, Public Administration, Second Language Acquisition, and Nonproliferation and Terrorism Studies. These degrees are augmented by programs such as the Graduate Initiative on Russian Studies that leverage Middlebury’s strength in area study to compliment other focused degrees. Beyond the Middlebury Summer Symposium on Russia, MIIS hosts other unique research and internship programs are open to current students at Middlebury. A new “Study Away” program allows Middlebury undergrads to spend a semester in Monterey in lieu of one of Middlebury’s study abroad programs to take graduate-level courses and earn credit. Other short programs include well-established internship at the Center for Nonproliferation Studies, a Summer Peacebuilding Program, the Certificate in International Development and Social Change program, and the Social Impact Ambassadors Program. MIIS also has opportunities to pursue research on the Russian Far East over spring recess, to perform research in the China Field Research program over the summer, or to pursue other projects beyond those listed here. Most importantly, thanks to the College’s integration with the Middlebury Institute, there is generous funding available for Middlebury students. My time in Monterey this summer was fully funded by Middlebury (thank you President Patton!) and yours could be too! 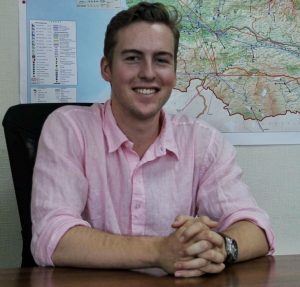 Matt Floyd ’18.5 is a Peer Career Advisor at the CCI and is an International Politics & Economics Major wtiha focus on Russia and Eurasia. 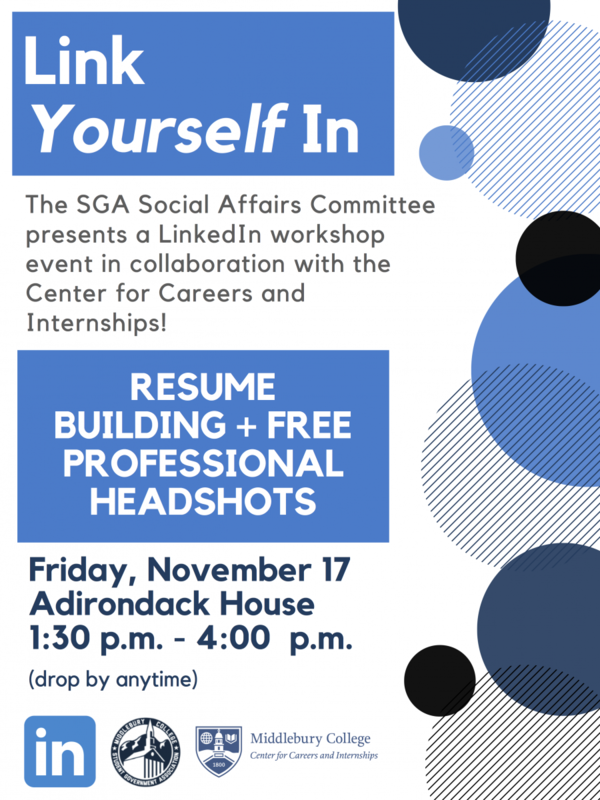 In his role, he helps students develop resumes and cover letters, prepare for interviews, and access helpful job and internship search resources such as Handshake. Meet with Midd alumni working in Marketing, Advertising, and Public Relations at UpNext: Careers in Communications. Participating alumni will lead panel discussions, networking, informal sessions, and more. This is an opportunity to explore the many facets of communication, hear about opportunities, and learn about pathways to success. Resume Review Office Hours and an Alumni Lunch Panel with the below participating alumni! Click here to review their bios and to sign up for your 1:1 slot! In the afternoon, Alumni will conduct workshops on roles and skills in Content Creation, Public Relations, and Digital Marketing. Click here to review the complete schedule including workshop descriptions. What role do international nongovernmental organizations play in promoting development? To what extent can they encourage environmental conservation and rural development, and make this model sustainable by creating a revenue stream rather than depending on grants? This experiential learning opportunity will entail 2 faculty and 3 students going to the Dominican Republic to evaluate an innovative development model used by Zorzal Cacao. This reserve-farm partnership links environmental conservation efforts to the development of sustainable and profitable organic Cacao cultivation. As such, it seeks to demonstrate how environmental conservation, local development, and profitability are not mutually exclusive, but in fact, can reinforce one another. Students will evaluate this innovative development model by conducting original fieldwork research, and could choose to engage in GIS mapping of existing farms to identify potential areas of development, survey farming partners to identify the strengths and weaknesses of existing partnerships, and research the factors that encourage or hinder potential new partners to participate in this model. Students will have a unique opportunity to engage in original fieldwork research and provide a professional program evaluation. 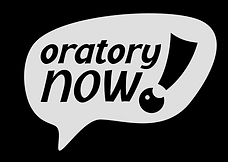 Students must speak Spanish at either a proficient or fluent level. Food focus – tree to bar, etc. November & December: students selected, and work with Professor Lewis and Professor Teets to develop projects. The owners will introduce the farm-reserve, and we will have other guests discuss different aspects of the project. 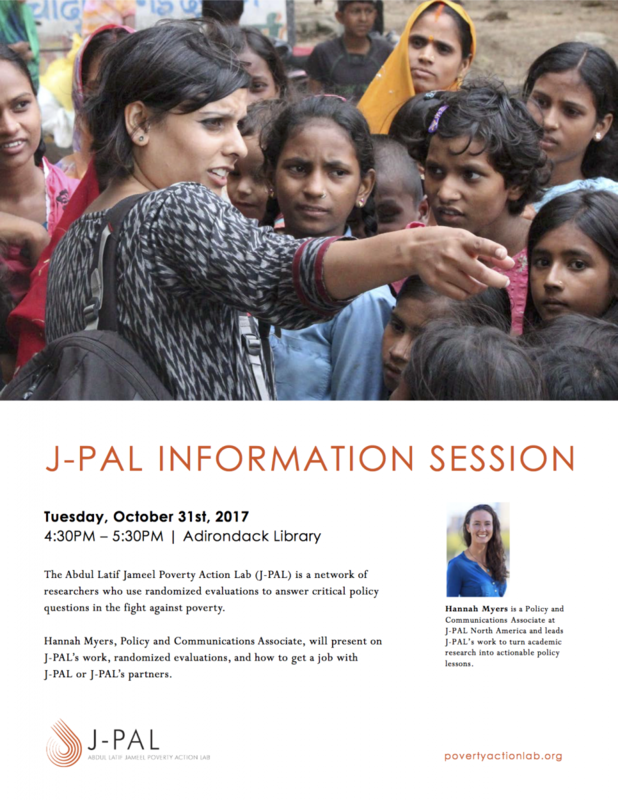 This opportunity is paid for through a Middlebury College grant, so all costs other than incidentals will be covered for participants. If interested, students should email Professor Teets with a transcript, resume, and short essay explaining why you would like to participate, what sort of project most interests you, and how previous coursework, skills, or experiences have helped to prepare you to work on a research team in the DR. Applications are due by November 7, 2017. We will not have professional interpreters with us, so all students must be at least proficient in Spanish (fluency would be even better).